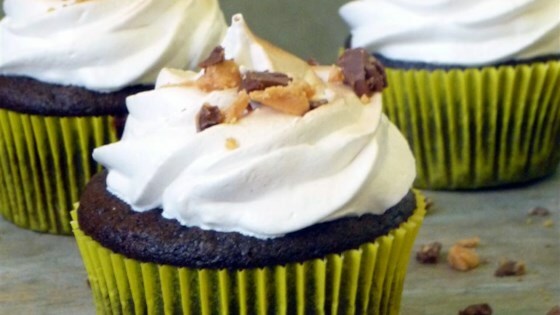 "Moist and delicious chocolate cupcakes with a peanut butter cup surprise inside." Preheat oven to 325 degrees F (165 degrees C). Line 14 muffin cups with paper muffin liners. Whisk flour, 1 cup sugar, cocoa powder, baking powder, baking soda, and salt together in a large bowl. Add milk, vegetable oil, 1 egg, and vanilla extract; mix using an electric mixer on low speed until just combined. Increase speed to medium and mix well. Reduce mixer speed to low and slowly pour boiling water into flour mixture. Increase speed to medium and beat for 1 minute. Fill each muffin cup halfway and place a peanut butter cup in the center of each. Bake in preheated oven until golden and tops spring back when lightly pressed, about 20 minutes. Remove from oven and cool in pan for 5 to 10 minutes. Cool completely on a cooling rack before frosting. Whisk egg whites and sugar together in a bowl until just combined. Pour egg mixture into a small saucepan and heat over medium heat until sugar is dissolved. Return egg mixture to bowl. Whisk egg mixture on high speed until still peaks form. Place peanut butter in a microwave-safe bowl. Heat on high at 15-second intervals, stirring in between, until peanut butter is thin and creamy. Gently fold melted peanut butter into egg whites. Transfer peanut butter frosting to a piping bag. Toast cupcakes under preheated broiler until lightly browned, about 1 minute.